The festive season is generally more about gorging ourselves than staying thin but we’re going to change all that with a quick introduction to minification. Performance has been a hot topic this last year. We’re building more complex sites and applications but at the same time trying to make then load faster and behave more responsively. What is a discerning web developer to do? For those that want to play along at home you can download the various utilities for Mac or Windows. You’ll want to be familiar with running apps on the command line too. HTMLTidy optimises and strips white space from HTML documents. It also has a pretty good go at correcting any invalid markup while it’s at it. CSSTidy takes your CSS file, optimises individual rules (for instance transforming padding-top: 10px; padding-bottom: 10px; to padding: 10px 0;) and strips unneeded white space. Remember to run JSLint before you run JSMin to catch some common problems. Images can be a real bandwidth hog and making all of them smaller with OptiPNG should speed up your site. All of these tools have an often bewildering array of options and generally good documentation included as part of the package. A little experimentation will get you even more bang for your buck. For larger projects you likely won’t want to be manually minifying all your files. The best approach here is to integrate these tools into your build process and have your live website come out the other side smaller than it went in. You can also do things on the server to speed things up; GZIP compression for instance or compilation of resources to reduce the number of HTTP requests. If you’re interested in performance a good starting point is the Exceptional Performance section on the Yahoo Developer Network and remember to install the YSlow Firebug extension while you’re at it. 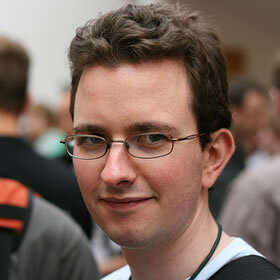 Gareth Rushgrove is web developer based in Cambridge and working in London for Global Radio. At work he spends most of his time writing Python and Django based applications or tinkering with testing tools. In the past Gareth worked on everything from successful marketing campaigns to enterprise content management and financial service applications. These days he’s generally found shouting about the benefits of APIs, XMPP and embracing the web as a platform. When not working, Gareth can be found blogging over on morethanseven.net or uploading code to github.com/garethr. He’s previously kept himself busy organising a BarCamp in Newcastle upon Tyne and starting the Refresh Newcastle user group. He also helped out on the board of the Thinking Digital conference last year. Lara Hogan ignites a little cognac over your web performance pudding by considering ways you can keep stakeholders invested in a site’s metrics and KPIs. More than just the budget, it’s the thought you put in that counts.